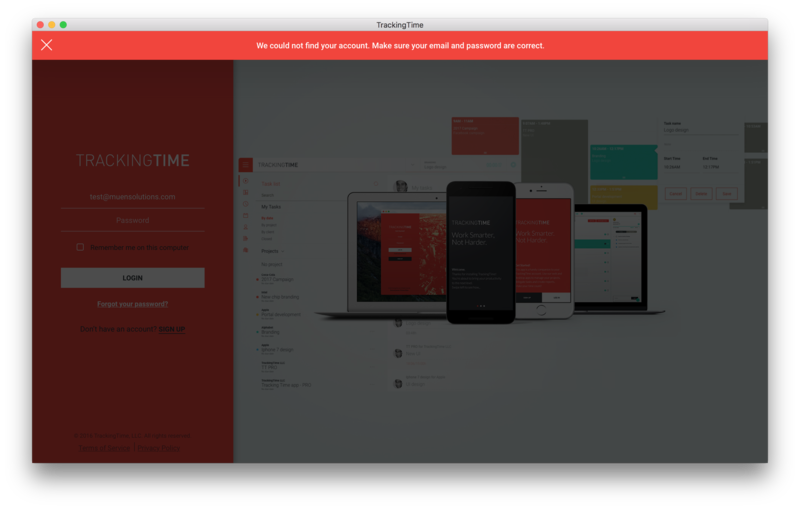 If you're having trouble logging into your TrackingTime account, here's how to identify the error and find a solution. If you get the error message "We could not find your account. Make sure your email and password are correct." something went wrong with your user credentials. It means that the system could not find any user registered under the email address or that the entered password doesn't match our records. Clean up your browser cache: In case you have recently updated your password, try cleaning up your browser cache. Reset your password: Please refer to this article to learn how to reset your password. If you receive an error message that reads "No active accounts found. ", this means that we have found your user account, but it doesn't belong to any company that is currently active or your user has been archived by the account administrator. Get your company account reactivated: If you're the account administrator and have canceled your account, please get in touch with us to get it re-activated. You cannot register for a new account using an email address that is already in use. Contact the account admin: If you're not the account owner, please get in touch with her. Your user account might have been archived by the account administrators.